Posted on Tue, Feb 7, 2012 : 5:40 a.m.
Spike is a beautiful, short-haired gray and white, rather plumpish, 8-year-old male cat. He has no physical ailment or any obvious feature to indicate he would be extra hard to adopt, but yet he’s been sitting at the Humane Society of Huron Valley since August of 2011. Spike's former family had some changes in the household, and when Spike couldn't adjust fast enough, he had to come to HSHV. Spike was not too pleased to be uprooted and in his early days at HSHV would give caregivers and other animals that got too close a good swat to show his unease and fear. This boy at times will give a bit of "cattitude" even now, but it's not aggressive by any means and most generally he's a lovely, laidback cat who likes a quiet home with a spot in the sun to curl up in. When you visit with Spike, you can see his wonderful cat spirit and he does enjoy a good petting and a scratch around his ears and chin. In fact, he can be very affectionate, and his purring will let you know how happy he is to have your attention. It seems somehow unfair that a really lovely cat like Spike might be staying at the shelter because he has a quirky moment once in a while or because he lets people know what he likes and dislikes. Can you imagine having to live up to these standards yourself? 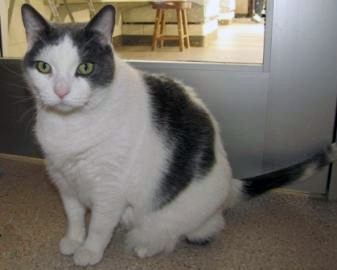 If you have been looking for a companion cat of your very own, please stop in and ask to visit with Spike. If you like a cat that is affectionate, smart and able to tell you what he likes and dislikes, then please come and see Spike. We know the right home is out there for this great cat and we hope someone will read his story and come and adopt him.